Good soil. A loose, fertile, level, well-drained soil is best. If possible, avoid heavy clays and very sandy soils, unless adequate organic material is added. Sunlight. Sunlight is absolutely necessary to produce healthy high-quality vegetables. No nearby trees or shrubs. Trees and shrubs compete with garden crops for sunlight, plant food, and moisture. Especially avoid walnut trees, because they produce a toxin that is injurious to many vegetables. Water supply. When possible, have a water supply near your garden site. 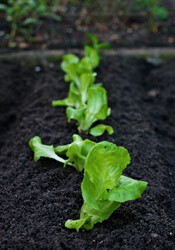 Water is particularly needed during the period of starting seeds or transplanting crops, but is of importance later also. Nearness to your home. If possible, your garden should be near your house for convenience and harvest. Part of landscape plan. When planning your garden, consider its relation to the trees, shrubs, and flowers around your home. The garden should fit in well with the overall design of your landscape.